Wouldn't it be wonderful if all dogs are trained? There'll be no chewed off furniture, no scratches on the walls, no dog poop on the carpet. The problem is, hiring a dog trainer can be rather expensive. And hiring one is not a fool proof guarantee that your dog will "learn" what was taught to him. What most dog owners do nowadays is to do the training themselves. And this is where dog training aids prove to be useful. 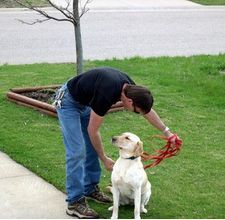 One of the most common tools is the dog lead or leash. These are made up of different materials like leather, cotton web, nylon and chain. Experts advise the use of leather leashes because of its durability and ease in use. It doesn't cut or burn the skin and is comfortable to use. Aside from these, it is lightweight and does not produce much noise unlike chain. Leather leashes may come in different styles and designs. It is sold in various lengths as well, the most common of which is 6 feet. Together with the leash is the collar. This may tighten or loosen, depending on the dog's movement. Slip or choke, collars are usually made of leather, and come in a variety of designs like rolled, field and braided. In choosing a collar, make sure that it fits the dog well. It must not be too tight or too loose. Instead of a leash, you may also use a 15-foot line. This is used to control the dog from a distance. Other aids include bait bags and pouches. These are used to make it easy for you to hand out motivators like treats and food while training. After some training time, your dog may show some signs of improvement. At this stage, use of the leash may not be required anymore. This is when some dog trainers use leather pull tabs and shark lines. This is also used in cases where the dog needs to undergo agility training. The dog may feel that he is off-leash, but you are still able to control and correct him by giving the tool a slight pull. Another aid used in training dogs for specific jobs is the whistle. Because the sound can reach far distances, this aid is ideal if training is done in large spaces such as farms and forest areas and in noisy areas. This aid is usually used when training dogs for hunting or gathering herd. Scent bands and dummies are also used together with the whistle. Dummies such as grouse, quail and pheasant wings are used to hold the scents. The scents make the dummies smell like real fowl. Other aids include halters, harnesses, bells, clickers, pads and ring gates. With advances of technology, there are also new electronic aids available. Among these are electronic collars and invisible fences. While these tools may seem complicated, with enough information they make great training aids. Training the dog yourself has its own rewards. With the proper orientation on how training is done and the proper dog training aids, your dog can sit, stay and roll at your call. You need to allot some time and space for training. It may be difficult, but the bond that training creates between you and your dog is one of the most important benefits that training does.